Mr. John Ferry was born on the 29th November 1831, in Sunderland, and, removing to Chatham, was engaged in the Dockyard till he retired on his pension. He was converted to God in the year 1864, and two years later was placed on the preachers’ plan by the Rev. John Hunt. At that time he was made Class leader and Station Steward of the Chatham Station, and held that position for 27 years, until the Circuit was divided and Gillingham became a Branch Station. Mr. 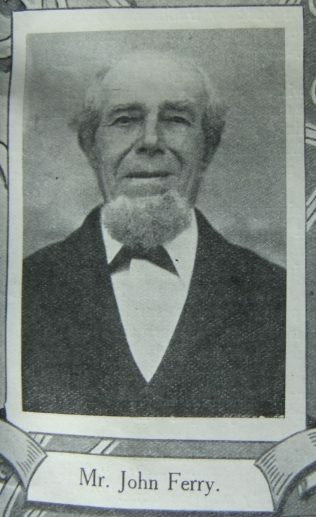 Ferry at that time removed from Chatham, and was appointed Steward of the new Circuit, so that for more than 40 years he has acted as Circuit Steward. Mr. Ferry has been a Class leader for more than 40 years, and meets his class every week. He has acted as Treasurer to the Trustees for many years, and was School Superintendent. Mr. Ferry is now in his 78th year, but works hard for the Church. John worked as a shipwright. Before arriving to work in the Chatham Dockyard, John spent some time working in the Portsmouth Dockyard. John married Margaret Hall (abt1831-1883) in the summer of 1851 at Sunderland, Co. Durham. Census returns identify one child. John married Mabel Broom (1832-1922) in the summer of 1885 at Sunderland, Co. Durham.